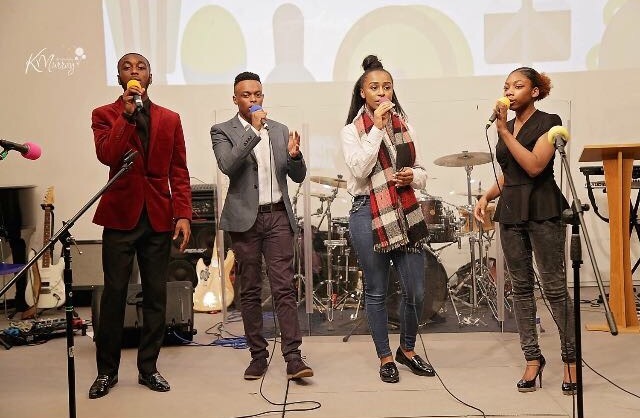 Artist spotlight: His Will — One Sound Music The home of the best in UK Gospel Music. Hey guys, it's been a while! Today we're back with our latest Artist Spotlight and this time we're featuring a very exciting group of young people from the West Midlands area. They are called "His Will" and God willing you will be seeing them on our youtube channel soon! Hey guys, lovely to have you on the blog today! Can you tell us a little bit about yourselves? We feel we are a friendly group of friends that sing contemporary style music. We mainly sing our songs acapella but we wouldn’t necessarily say that we are an acappella group. At the moment we have a group of 5 members. We say at the moment because over the years the number has fluctuated between 3 and 7 and with members at uni not being able to be as active as they would like we find it hard to pinpoint the actual number. Why did you choose your name? What does it mean? So our name is pretty self explanatory we are mainly here to do the will of God. His Will. And disclaimer we actually didn’t choose the name ourselves it was chosen by a woman from one of our churches. We went around for a while without a name funny enough because we just didn’t know what to call ourselves and she just laid it on us. It’s all explained in our song “His Will” where it pretty much explains us doing the work of God. Wow, that is great. How long have you guys been making music? We have been doing music for quite a while. All of us have been singing since a very young age but as a group we have been together about 4 years. 4 years is actually a long time! How did you get started? For some reason Adrian tells this story a lot differently than everyone else. He would say that we evolved from being the “Adrian’s group” but it really didn’t. Ok so Danielle wanted to sing the song “Potter’s hand” with Alvin and after they sung it they thought it would have been even better with a 3rd harmony. So they brought Delainie in to make a trio. Adrian thought he would be a really good addition to the group after that so he became the bass singer. This is how the group was first born really in about 2013. Wow, I love hearing group origin stories, they're always so cool and yours is no exception! It actually reminds me a bit of the story of my all time favourite Acapella group Take 6. They have influenced me and my music in so many ways! So talking about influences, who would you say is your favourite Christian/gospel influencer/artist? At the moment we all have DEFINITE differing opinions but our artists are as follows: Joyous celebration, Isaac Cates, Todd Dulaney, J Moss and Bill Gaither. You've listed some real powerhouses of gospel singing and songwriting there! Who would you say is your biggest influence? Our styles are all so different its actually mad to try and pinpoint 1 influence. So we won’t. That’s our rebellious side shining through here haha but we will only name a couple. Resound are a big influence on us. Their blend is crazy! We would also have to say SCRIPTURE SAYS!!!!! Well they’re just……they’re just! We just love them! They’re almost as weird and crazy as us to be honest and their harmonies are just……..(speechless there’s no words at the moment). They’re our sister group. But we admire and appreciate their acappella vibe its so refreshing and different. Aww I love that! They're were equally gushing about you so it's great to see the mutual respect and admiration. Speaking of Scripture Says, they are phenomenal songwriters as well. Are you guys into that as well? How many songs have you written? We actually have quite a few songs written to be honest. Our problem mainly is that we don’t get anything down recorded or even sing them all. We would say that we officially have 4 songs though because they’re the ones we have actually sung. I see, so you have loads in the bag/pipeline but only 4 you've performed. Great stuff! What about instrumentation, do you play any instruments? If so which ones? If not, which would you choose? We're all at different stages with this! Richard – doesn’t play an instrument but would like to learn the bass. Adrian – Plays saxophone and violin and would like to learn the guitar. Serene – Plays violin and would like to learn piano or guitar. Danielle - Plays piano and would like to learn the bass and the ukulele. Alvin - Plays saxophone and piano and would like to learn the musical saw and trumpet. Ok so moving on, if there was 1 artist you could work with, who would it be and why? That’s so tough because there are so many artists that we would love to work with both as a group and individually but the main ones would need to be: Lalah Hathaway, Fred Hammond, Jason Nelson, Jonathan McReynolds. You just named my favourite male vocalist and favourite female vocalist, can we just take a minute :D Good choices there indeed, I'd love to work with any of them but especially Lalah and Jonathan! Tell us 1 quirky thing about you guys as a group? 1 quirky thing about us is that we are actually quite weird and we admit it lol. But we think that being weird is part of our personalities. We are all definitely different weird and funny in completely different ways but we all work together. Most of the year is gone now lol, but I'll ask anyway. What does 2017 hold for you? 2017 is a very steady year for us we are planning to do some recording to actually try and get some of our original music down somewhere. But that’s mainly our plan. That's great, we really need more of a recording culture in the UK gospel scene ESPECIALLY in the SDA church which has so much talent. Good to see you're doing your bit for the culture! Aside from music, what would you say is your biggest passion? Food! Say no more. We know that might sound so weird but we all really love food. We love cooking, we love going out to eat. We love dessert. Omdz dessert yaaasss heavenly desserts makes us very thankful. If we are ever in a bad mood all we need is either a waffle or a really good burger. LOL! Where do you guys put the food? Y'all do a good job of hiding it away! Ok so let's move on to some questions about you as a group. Quickfire, ready, fire, aim! Numero uno: Who's the loudest in the group? Serene. Without a shadow of a doubt. If you know her you know her. LOL! I thought she was pretty quiet myself tbh #justsayin (ok maybe I'm trying too hard?) Anyway, who's the biggest joker? We are all funny we like to think anyway but Alvin is really funny. We’re undecided about whether we say this in a good or bad way though. There are some days that we question and wonder about him. Lol! Who is the deepest thinker? The deepest thinker is definitely Alvin he questions everything. He’s just different. Wow don't have it Alvin! Who is the most creative? The most creative of the group are definitely Danielle and Alvin. It’s like they’ll say they want to show us something they’re working on or a mess about and then all of a sudden its like bam! You’re actually floored. What's your proudest moment as a group been so far? We would have to say our proudest moment was opening for the group Committed. We opened with the song 'The Lord’s prayer' by Isaac Cates and it’s one of the hardest songs we have sung as a group. Adrian hates starting songs but he did really well. It was the first time that we have done a full set instead of just 1 or 2 songs. It was such hard work and the feedback that we got after the concert was so encouraging and positive. Yeah we were at that concert and y'all were off the chain! Amazing (glory up) Where do you see your ministry in 5 years time? We would want to be on our 2nd world tour. No that’s a joke aha we aren’t ready for that sort of thing any time soon. We would want to have released an album, maybe 2 hopefully. At the moment God has been leading and a lot of people have been asking when certain things are going to happen with us but we are still following God’s direction. You know what, that's a great place to end this. Your name is His Will and it's great to see that in your ministry you're serious about following His will and His direction. Is there anything else you'd like to share? Really we just want to share our music. We have instagram and facebook under "hiswill music". These are our main sources. But watch this space for updates of our material we do have plans. Thanks for joining us today and sharing your journey His Will. You can check them out on Facebook by following their page here: His Will or on Instagram page here: His Will. Till next time, blessings! (L to R) Danielle, Serene, Alvin, Adrian and Richard.